WASHINGTON (JTA) – While the Iran nuclear deal gets fleeting attention in the presidential race, it is shaping up as a key issue in at least nine states integral to Democrats’ hopes of regaining control of the U.S. Senate. Rival pro-Israel factions are pouring money into many of those races, and candidates are using support or opposition to the controversial deal as a means of tarring their opponents. Democrats are seeking four to five wins to regain control of the chamber. Up to 11 states are in play; Iran is an issue in at least nine. Iran has entered the calculus in a way that reflects the split between J Street, the liberal Jewish Middle East policy group, and the American Israel Public Affairs Committee, the powerful centrist lobbying group. J Street and AIPAC, which does not back candidates, went head to head over the Iran deal, which exchanges sanctions relief for a nuclear rollback. The former worked hard to keep lawmakers from rejecting the deal; the latter led the effort to kill it. Anti-deal forces garnered more votes, but pro-deal backers kept them shy of the necessary two-thirds majority to override President Barack Obama’s veto. On Wednesday, J Street said it was ready to spend $750,000 backing endorsers of the deal in four critical races, including two that include expensive ad buys on TV. Pro-Israel political action committees that lean further to the right, including NORPAC and the Republican Jewish Coalition’s PAC, are spending on candidates who opposed the Iran deal. “We’re aiming to fundamentally transform the political calculation by demonstrating that the Iran nuclear agreement and diplomacy-first approaches make for good policy and for good politics,” Jeremy Ben-Ami, J Street’s president, said in rolling out the ad campaign. “The Obama/Clinton Iran deal puts Israel at risk and makes us less safe” is the title of one of several leaflets that the Republican Jewish Coalition has distributed to Jewish homes in several key states. Here’s a look at how the battle is playing out and what it means. There are 34 Senate elections this year. Polling suggests that 11 could switch parties, although incumbents in some of these have begun to pull away from challengers in recent weeks. Ten of the races – Arizona, Missouri, Wisconsin, Illinois, Indiana, Ohio, Pennsylvania, North Carolina, New Hampshire and Florida – could go from Republican to Democrat. Nevada could go the other way. Show me the money: How high does Iran loom? OpenSecrets, the campaign finance tracker, shows that Kirk’s single biggest donor among PACs is NORPAC. Donors have funneled $130,931 to date to Kirk through the New Jersey-based pro-Israel PAC. 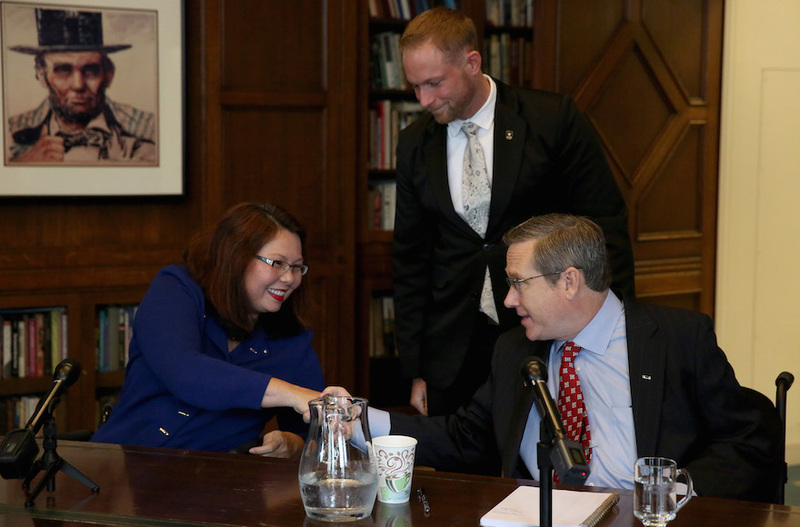 J Street ranks second among Duckworth’s biggest PAC givers, sending $145,832 to the aspirant. Only Emily’s List, a feminist PAC, has provided more. In Wisconsin, J Street ranks third among the PACs backing Democrat Russ Feingold, the former Wisconsin senator who is challenging the man who replaced him, Republican Ron Johnson. Feingold, who is Jewish, has earned $68,600 in contributions from J Street. Johnson, a millionaire who self-funded a hefty portion of his 2010 campaign, has attracted $29,200 from pro-Israel PACs to the right of J Street. The Republican Jewish Coalition has launched door-knocking and phone-banking campaigns in Florida, Pennsylvania and Ohio, with a main focus on protecting Republican incumbent senators, citing their opposition to the Iran deal. J Street runs essentially the same ad in New Hampshire, Illinois, Wisconsin and Pennsylvania. Its pitch is primarily political, coupling Donald Trump, who is unpopular, with the Republican incumbent senator – Kirk, Johnson, Kelly Ayotte of New Hampshire and Pat Toomey of Pennsylvania. Sen. Rob Portman, the incumbent Republican in Ohio, has run since the summer of 2015 at least three ads attacking his J Street-backed challenger, former Gov. Ted Strickland, for backing the Iran deal. Portman’s emphasis has been how the sanctions relief frees up funds Iran “can now use to fund terrorist groups,” as the campaign put it in a February ad. In previous years, candidates seeking the pro-Israel vote and money hewed to parameters set by centrist organizations like AIPAC or those to its right. The handful who defied those norms invited infusions of cash for their opponents from pro-Israel givers. J Street, launched in 2008, sought to change those terms by creating room for candidates to embrace a more aggressive U.S. intervention in Middle East peacemaking. Until this year, that metric left plenty of wiggle room: AIPAC, after all, embraced the two-state solution, and there were plenty of lawmakers who could comfortably work the halls of AIPAC’s policy conferences and also appear at J Street’s annual dinner as sponsors. J Street wants to change the Israel calculus in how candidates run for office, and the either-or nature of the Iran debate is part of that formula. AIPAC, however, is hardly going away: Last month, it got 88 senators to sign off on a letter urging Obama not to allow the Palestinians to pursue statehood recognition absent peace talks during Obama’s final months in office. Some of the 12 who did not sign on, including Rubio, abstained because the letter embraced an outcome — the two-state solution — no longer endorsed by the Republican Party. * A win by Democratic presidential nominee Hillary Clinton coupled with a retaking of the Senate would consolidate the Iran deal as unsinkable and make J Street’s win in last year’s congressional lobbying wars more formidable. * J Street could also seize on the ouster of senators closely identified with trying to kill the deal – as opposed to those who simply followed GOP party lines and voted against the deal – as a sign that hewing the AIPAC line is box office poison. Among those at risk who fit this bill are Ayotte, Kirk, Rubio, Portman, Roy Blunt of Missouri and John McCain of Arizona.